Birder’s Notebook by Bob Andrini; 2 October Entry. 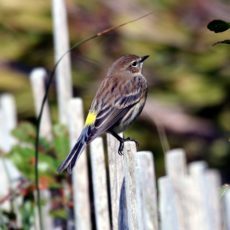 The yellow-rumped warbler is one of the first warblers to appear during the spring migration, and one of the last to show during the fall migration. 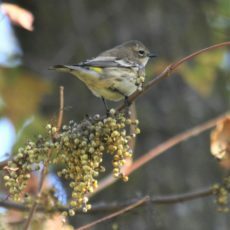 I have been seeing a lot of yellow-rumps this past week, so warbler migration is probably ending. 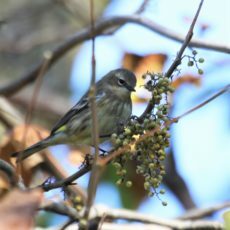 The scientific name of the yellow-rumped warbler is Dendroica coronata – Dendroica comes from the Greek meaning ‘tree dwelling’; coronata is from the Latin meaning ‘adorned with a wreath or crown’. The name fits them since they spend so much time in the trees, and they so have a crown of yellow (although you don’t always see it). 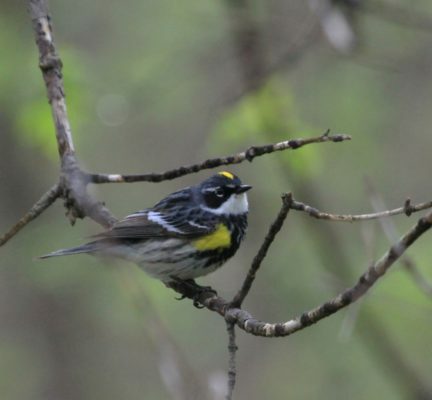 The fall plumage is different from their spring plumage (adding to the concept of ‘confusing fall warblers’). Both male and female sport the yellow rump (and are sometimes called ‘butter-butts’). One of the problems with seeing these birds during the fall migration is that they are consistently on the move, and hard to get the binocs on them. Inset photo shows the typical spring plumage, while the others below show their fall wardrobe.